There's perhaps no purer sense of faithfulness than that of a dog toward his human companions - a bond of loyalty and love that can last even after death. Earlier this week, police were called to a remote location where a man had been murdered near his home in Paraná, Brazil. When they arrived, they discovered the victim's two orphaned dogs standing guard at the scene, tired and confused but still unwilling to leave their dead owner's side after an entire day had passed since his death. Tragically, even after the victim's body was loaded into a car to be driven to the morgue, the dogs refused to be parted. Instead, they followed the vehicle for more than 10 miles until they could run no more. A local reporter, Carlos dos Anjos, happened to capture a portion of the heartbreaking scene on video. 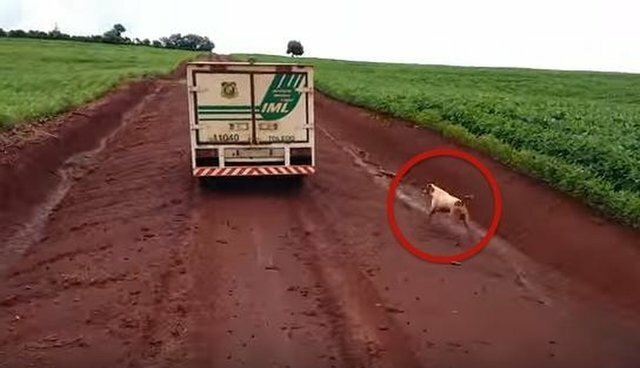 "The dogs seemed very loyal to the owner," Anjos told Globo News. "They followed almost all the way until the exit to the city. The bigger dog was in front of our car, following the [coroner's car], and the smaller was behind us. They were quite anxious, not letting anyone get near the body and after were following, running and barking." Anjos informed the victim's extended family about the dogs, and later returned to help bring them to safety. He was so moved by the animals' loyalty that he offered to adopt one of them, while the victim's neighbor has agreed to care for the other. "This is a great lesson. The dog was loyal to the owner even to death," Anjos told Globo. "This shows that one should never abandon any animal."